CHARLOTTE HARBOR & THE GULF ISLANDS (May 31, 2016) – Tickets are now on sale for the Sugar Bert Boxing Title Belt National Qualifier Tournament scheduled for June 11 & 12 at the Charlotte Harbor Event & Conference Center (75 Taylor St.) in Punta Gorda, Fla. Five hundred amateur boxers of all ages and weight classes will compete in three different rings over two full days in an Olympic-style boxing tournament. This is a double elimination tournament and winners of each weight class division(s) will win a Title Belt and advance to the National Championship, November 18 -21, 2016, in Kissimmee, Fla., at The Park Inn Radisson Resort Disney World. The Sugar Bert Boxing Title Belt National Qualifier Tournament is produced by Sugar Bert Boxing Promotions in partnership with the International Amateur Boxing Association (AIBA), USA Boxing, Title Boxing, and Team IP. VIP ringside seats are $25 each day and single day general admission tickets are $15. Admission for children, ages 4 – 8, is $10 each day. Doors open at 10 a.m. both days. Tickets may be purchased online at www.sugarbertboxingpromotions.com/puntagorda. The Charlotte Harbor Boxing Club anticipates approximately five local boxers will compete in the tournament. It’s anticipated the event will attract 500 amateur boxers both male and female in all age groups and weight classifications. 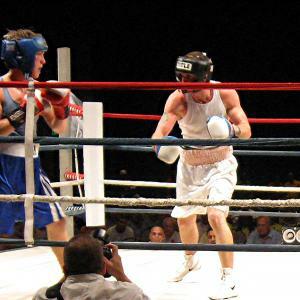 USA Boxing is the national governing body for Olympic-style amateur boxing. It is overseen by the United States Olympic Committee and the International Boxing Association (AIBA), who sets its rules.